Scanning, copying and printing of technical documents has never been easier. At every stage from scanning documents to final output, the MFP Solution is designed to simplify workflow with easy operation. It offers a choice of interfaces, both of which offer a dynamic preview that guides users through every function and process in simple steps: an All-in-One 19.5 inch HD multi-touch screen Windows PC or a 22″ LCD Touch screen interface, which requires an external PC. The imagePROGRAF MFP M40 allows you to customise your solution with a choice of configurations from 36″ to 44″ making it ideal for all sizes of workgroup such as technical and CAD drawing offices, architects & engineering firms and geographic and mapping projects. This versatile scan and print solution is designed to meet the speed and precision requirements for CAD/GIS with ease-of-operation for all office projects. A built in accounting function allows accurate tracking of the cost per print enabling you to view the data through the printer driver. Economy mode can be selected which uses less ink, ideal when printing draft documents. Canon’s optional eMaintenance software automatically detects and manages mechanical problems and low ink levels linking directly to Canon Service. SingleSensor (CIS) with bi-directional LED light system can produce exceptional scan quality with accurate, consistent colour and more control over details in the shadows and highlights. Also, Canon’s 5-colour dye-and-pigment ink system produces vivid colours and the sharpest, lines. With an accuracy of +/- 0.1% as well as a minimum line width of 0.02mm, precision is guaranteed. Images are rendered at 2,400 x 1,200 dpi for maximum impact from super-fine print heads using 15,360 nozzles. 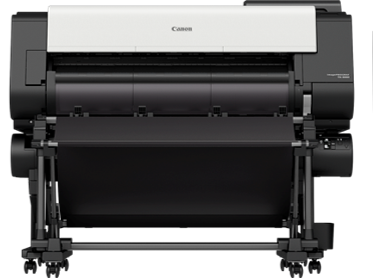 The Canon TX-3000 is a 36-inch wide printer capable of printing 3 D-sized sheets per minute. This output matches the performance of most toner plotters that cost three times a much. The TX-series features an all-new 5-color TD pigment ink set. This ink was formulated to produce fine lines and sharp text on both inkjet and non-inkjet paper. Combine this pigment ink with water resistant media and you have a printed drawing that can withstand the outdoor conditions of a construction site. The Canon imagePROGRAF TX 3000 36-inch represent the next standard in wide-format printer engineering. See some of the technologies found exclusively in Canon systems. The newly designed PF-06 is a 1.07-inch, 6-channel print head with 15,360 nozzles. Combined with the TX-3000’s high speed carriage transfer and ink ejection, this print head allows for ink to be laid down quickly and precisely. Unique 5-colour, full pigment Lucia TD ink in the TM-300 MFP L24ei, from Global Scanning, delivers crystal clear lines and text, as well as bold colour. Working in parallel, SingleSensor Technology speeds up scanning without compromising quality.